Did I ever tell you about that time I met Shane Battier? It was Rockets Play Day 2009, where season and mini-season ticket holders get a chance to hang out, take a snapshot with, or cop a signature from the players. (The most underrated and often forgotten part of the day was that I would not have gotten a free ticket to attend this extravaganza if it wasn’t for my friend Timmy’s dad being unable to make it, so thanks Mr. Chui.) I was at Toyota Center with my friends Timmy, Albert, and Koller, and I remember I had gotten a slip of paper to redeem for an autograph session with Von Wafer. As has always been my policy, a picture is worth a thousand words (or 500 signatures), so I managed to trade one of my friends for his photo session with Shane Battier. 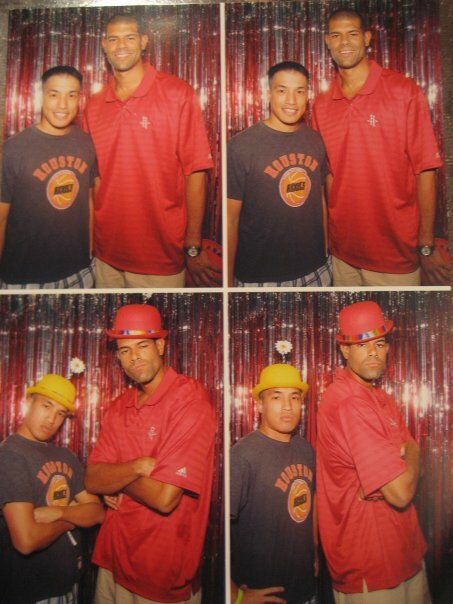 I descended down onto the basketball court and realized that it wasn’t just going to be a simple polaroid snap-and-go -- there was a photo booth set up with 6’ 8” Shane Battier crammed inside. As I waited in line, I sorted through some of the props that were available to use and settled on two clownish hats with flowers sticking out the top. One red, one yellow -- to rep the old school (and rightful) Rockets team colors, of course. It was then my turn, so I walked into the booth, introduced myself, chatted briefly, and watched the camera click four times. As for me, I can honestly say that I loved the 2006 draft-day trade that the Rockets made to acquire Shane. (You hate letting go of the potential of Rudy Gay, but in actuality, the part of the trade that worried me most was having to toss Stromile Swift into the deal as well. Long live Stro Show.) Shane was what the Rockets needed most -- a good individual defender who could stick on the opponent’s best wing, a great team defender who could take a charge or get a weakside block, and a consistent shooter who could knock down the open three-pointer. Houston had just suffered through year 2 of the Yao/Tmac experience which saw them miss 70 games combined and enter the lottery. Management knew that the window of opportunity was closing with this team, so assuming the pair could stay healthy, you gotta go full win-now mentality. After five memorable seasons with the Rockets, Shane Battier was dealt to the Grizzlies last year for Hasheem Thabeet, DeMarre Carroll, and a first-round draft pick. I was sad to see him go and thought we could have gotten more in return, but I couldn’t have been happier for him when on April 17, 2011, with Memphis down by two to the San Antonio Spurs, Shane made the game-winning three to give the city its first playoff win in franchise history... on the same day that his high school sweetheart gave birth to their second child. Amazing. Oh, and his team went on to defeat the #1 seed Spurs to move on to the 2nd round. But alas, the man is now on the Miami Heat playing alongside the guy I hate most in the league, LeBron James. If El Heat end up winning the ship this year, the fact that Shane would receive a ring would be the only possible saving grace to this shambles of an NBA season. Now please excuse me while I go browse Amazon for a sackcloth to wear after tearing one’s clothes Bible-style in the instance of Queen James getting fitted for a championship ring. Can't wait to see the King get fitted for a ring by the team, but then also get fitted for a crown by himself. Lebron.